Ohio’s Brendan Cope catches a pass in front of Kansas’ Hasan Defense (13) during the Bobcats’ 42-30 win on Saturday in Athens, Ohio. 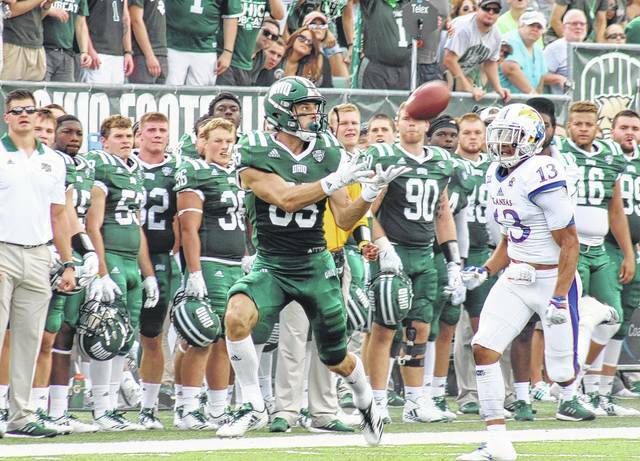 Ohio tight end Troy Mangen (82) hauls in a touchdown pass during the Bobcats’ win over Kansas on Saturday in Athens, Ohio. ATHENS, Ohio — Back at home and back in the win column. 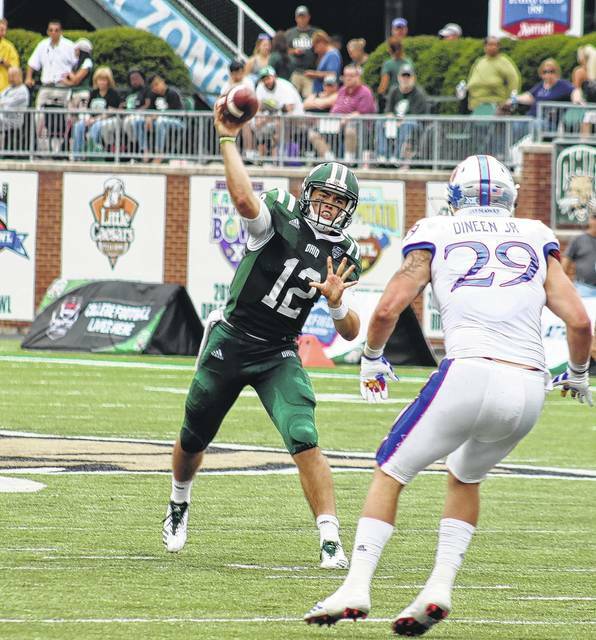 Coming off of a disappointing road loss, the Ohio University football team bounced back in a big way on Saturday afternoon at Peden Stadium, defeating the Big 12 Conference’s Kansas Jayhawks by a 42-30 count. The Bobcats (2-1) took an 11-0 lead in the first quarter, combining a Louie Zervos 41-yard field goal with a three-yard Nathan Rourke touchdown run and a two-point conversion pass from punter Michael Farkas to long snapper Jake Hale. 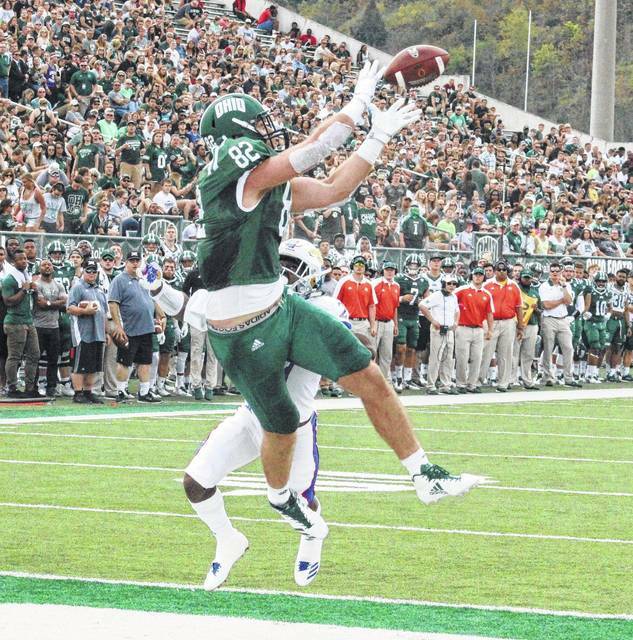 Ohio went ahead 18-0 seven seconds into the second quarter, when Rouke found Troy Mangen for a 10-yard scoring pass and Zervos hit the extra-point, his first of four on the day. With 9:11 left in the first half, the Jayhawks (1-2) ended the shut out with a 56-yard Khalil Herbert touchdown run. Gabriel Rui made the point-after kick, his first of three, and Ohio’s lead was trimmed to 18-7. Less than three minutes later, OU answered the score with a nine-yard touchdown pass from Quinton Maxwell to Mangen, which capped off an impressive 91-yard drive. However, Kansas responded with an 18-play, 6:02 drive, resulting in a nine-yard scoring pass from Peyton Blender to Chase Harrell. The Bobcats were left with just eight seconds on the first half clock, took a knee, and went into the locker room ahead 25-14. Ohio stretched its lead back to 18 points with 9:53 left in the third period, as redshirt junior A.J. Ouellette scored on an eight-yard run. With 18 seconds left in the third, OU extended its lead to a game-high 25 points as Rourke found Andrew Meyer for a nine-yard touchdown pass, capping off a 12-play, 84-yard drive. The Jayhawks scored 31 seconds later, when Blender connected with Jeremiah Booker for a one-yard touchdown pass. Rui then trimmed the Bobcat lead to 15 points with a 34-yard field goal at the 5:35 mark of the fourth quarter. Ohio’s final score came with 2:13 left, when Zervos made a 46-yard field goal. As time expired, Herbert ran in a two-yard touchdown for the Jayhawks, making the final margin 42-30 in favor of OU. The Jayhawks outgained the Bobcats 451-to-450 in total offense, but OU held a 196-to-108 edge on the ground. Both teams committed one turnover and seven penalties, with flags sending the Bobcats back 61 yards and KU in reverse 50 yards. Kansas punted four times, pining Ohio inside its own 20 twice. Both of the Farkas’ punts gave the KU offense 80-or-more yards in front of it. The Bobcats also held a 5:16 advantage in time of possession. On the ground, Ohio was led by A.J. Ouellette with 102 yards and one score on 10 carries. Dorian Brown rushed for 68 yards on 12 tries, while Julian Ross added 32 yards on seven attempts. Brendan Cope led Ohio with 104 yards on five receptions, Meyer added 86 yards and a touchdown on five catches of his own, while Mangen hauled in three passes for 35 yards and two scores. Prior to leaving with an injury, Papi White hauled in a 17-yard pass, while D.L. Knock and Cameron Odom had a reception apiece for seven and five yards, respectively. In his first start at quarterback for the Bobcats, Rourke completed 11-of-16 passes for 152 yards and two scores, while rushing for a touchdown as well. Also seeing time behind center, Quinton Maxwell completed 5-of-6 passes for 102 yards and a touchdown, with one interception. Herbert led the Jayhawks on the ground with 137 yards and two scores on 19 attempts, to go with 18 yards on two receptions. Steven Sims Jr. and Quan Hampton both hauled in six passes to lead KU receivers, gaining 60 and 39 yards respectively. Evan Fairs had a team-best 77 yards on three receptions. Bender was 30-of-47 passing for 343 yards and two touchdowns, with one interception thrown to Bobcat Jalen Fox. 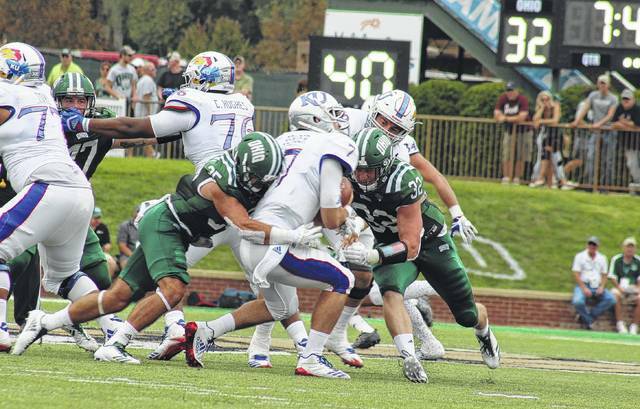 The Green and White defense came up with five sacks on the KU quarterback, led by Trent Smart and Cleon Aloese with a 1.5 sacks apiece. Quentin Poling led OU with nine tackles, followed by Fox and Javon Hagan with eight each. This is Ohio’s fifth win over a Power Five school in Solich’s 13-year tenure in Athens. OU is now 3-0 against KU all-time, with Solich holding a 8-0 record over the Jayhawks. The Bobcats are on the road to begin Mid-American Conference play next, visiting Eastern Michigan on Saturday at 2 p.m.